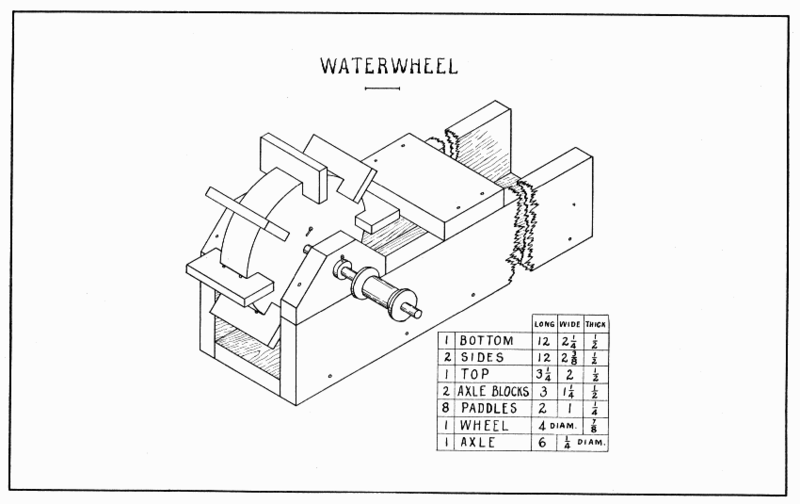 This waterwheel is designed to be placed in a flowing stream. A longer trough might well lead the water into this one so as to get greater speed. Make the trough first, being careful to make a good fit where the sides nail to the bottom. Nail the top 5" from the end where the wheel is placed. The upper corners of the axle blocks are to be cut off 1". The center of the 5/16" hole for the axle is 7/8" from the lower edge. When nailing the axle blocks in place, put a dowel or lead pencil thru the holes to help in nailing the blocks exactly opposite each other. After sawing a board for the wheel 4-1/4" square, draw the diagonals and diameters (cornerwise and crosswise, that means) to divide it into eight parts. Draw a 4" circle for the wheel and a 3-1/4" circle to mark the depth of the notches for the paddles. Draw a line thru the center the way the grain goes and another at right angles to it, thus dividing the circle into quarters, Fig. 1. Notice, now, that to avoid splitting the circle, the four quarters must each be cut in a different direction. Lay the model flat on the bench-hook and saw off the corners of the square. Now, holding it in the vise with one quarter up, with the spokeshave, pare the corners in the direction of the arrow in this quarter until the circle is reached. Be careful not to pare away any part of the line. It will be observed that paring can be done safely on the end grain beyond the arrow-head in this quarter, but this is not at all possible on the side grain where the arrow begins. The spokeshave should be held rather lightly so as to allow it to follow the curve. Observing carefully the direction of the arrows, proceed with the other quarters in this same manner. The last few chips should be very fine ones. Test it with the trysquare to keep the edge square with the flat surface. Bore a 1/4" hole in the center with the greatest care, or the wheel will wobble sidewise. The notches are cut with the back-saw alone. 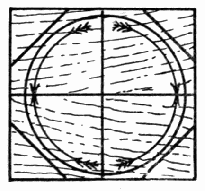 One-eighth of an inch to one side of the eight lines across the circle, saw straight down to the inner circle. Be careful to hold the saw square with the wheel. After this saw cut is made, measure the width of the notch by holding the edge of a paddle so as just to cover the saw cut, and, with a knife point make a dot at the other side of the paddle. Holding the trysquare against one side of the wheel and the inner edge of its blade over the dot, score a knife line across the edge of the wheel. Then saw straight down again inside this knife line. Saw cornerwise a few times and the wood will be removed sufficiently. The notches may better be too small than too large, for the paddles can be planed thinner to fit. Clean the wheel with the plane before nailing the paddles. All these paddles except one can be nailed with the wheel held in a corner of the vise. To nail that one, put a thin board upright in the vise and rest the wheel on its top. All nails should be started in the paddles, not in the wheel. Make the axle of hard wood. Push it thru the axle blocks and wheel, and lock it to the wheel with a brad (see diagram). The axle is made long so that a pulley (spool) can be put on and a belt (string) run from this to other pulleys. 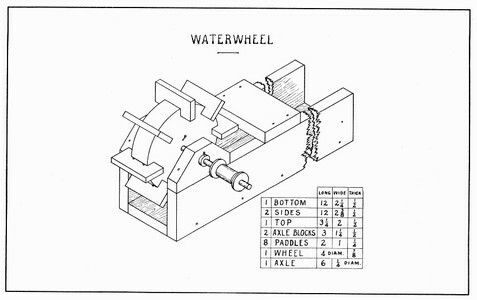 A leather washer outside each axle block keeps the wheel in the center. If the work has been carefully done, the paddles will not strike; if they do strike, they must be pared off.